production for use in industrial and harsh environmental applications. 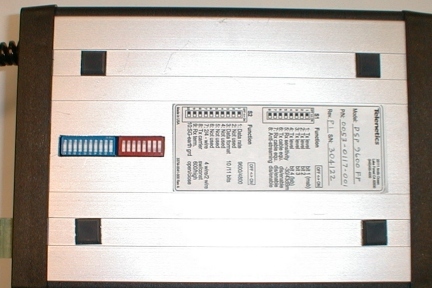 SCADA, traffic and the oil industry are only a few of the markets that this cost effective, point-to-point or point-to-multipoint, modem serves and is best suited for twisted-pair and leased telecoms line applications. 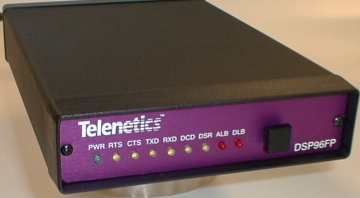 The 23ms RTS/CTS training time allows multi-drop fast polling of dedicated line remote terminal units to upgrade their speeds from the historic Bell202T modems at 0-1800bit/s to 9600bit/s. The 202T mode is switch selectable to 9600bit/s. 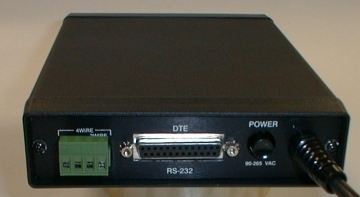 A unique feature of auto RTS/CTS allow polling of "dumb" devices without RS232 control signals. The first model of this series is a stand-alone unit powered by 85 to 265V AC, 50-60Hz power with filtering and 3750V surge protection. A low-voltage 12/24/48V DC powered model and a card/rack model that fits a Motorola RM16 slot chassis will follow. All models offer line isolation and are temperature hardened to operate in -40 to +85C. All options are switch selectable and do not require a computer to program settings. The model DSP9612FP is based on a digital signal processor and offers polling over voice grade telephone lines at 1200bit/s in the 202T mode and 9600bit/s with a fallback speed of 4800bit/s for lines of lesser quality. Robert Way, Director of Sales and Marketing for Telenetics Network Products Group said, "This modem is eight times faster that the industry standard 1200bit/s Bell202T. In fact, it is so fast we refer to it as our Flash Poll model.